On October 5, 1944, after nine years in the minor leagues, 30-year-old rookie pitcher Blix Donnelly reached the pinnacle of his baseball career by winning a World Series game. Donnelly entered the second game of the 1944 World Series for the St. Louis Cardinals in the eighth inning with the score tied 2-2 and no one out; Mike Kreevich of the St. Louis Browns was on second base. Donnelly struck out the first two batters he faced, surrendered a walk, and then ended the inning with a strikeout of Mark Christman. He retired the Browns in the ninth and 10th innings with little trouble. In the 11th inning, with George McQuinn on second, Christman laid a bunt down the third-base line that Donnelly fielded with his bare hand and tossed to third to get the runner. The play was heralded as the defensive play of the World Series and one of the better defensive plays in World Series history. Donnelly got credit for the win when the Cardinals scored in the bottom of the inning. The Cardinals went on to win the Series in six games, and Donnelly’s Game Two performance were the highlight of his eight-year major-league career. Born Sylvester Urban Donnelly on January 21, 1914, in Olivia, Minnesota, a farming town with a population around 1,500 in southwestern Minnesota, Blix got his nickname from his father at a later date.1 Blix’s father, Charles, was born in Wisconsin and migrated to Minnesota, where he became a barber in Olivia, a trade that Blix learned and practiced during the baseball offseason. His mother, Elizabeth, was born in Minnesota to French immigrants and married Charles in 1913. Blix was the first of three boys born to the Donnellys, the others being Gordon, born in 1916, and John, in 1924. Donnelly spent the next two years working while playing for Olivia’s town team. He picked up extra money pitching for neighboring town teams. In the summer of 1934 Donnelly made an impression on George Thompson, an umpire, that led to an invitation to a three-day baseball school at Nicollet Park in Minneapolis.3 Donnelly was one of 30 players from outside the Twin Cities area invited to the school free of charge. Another 11 Twin Cities-area players were invited free of charge while 227 other youngsters paid to attend.4 Two other future major leaguers attended the school that year, Jimmy Pofahl and Mickey Rocco. The attraction of the school was the opportunity to pitch in front of Mike Kelley and the Minneapolis Millers staff. Donnelly’s small size at (5-feet-10, 165 pounds) did not impress the Millers, but his fastball did get him a tryout and a contract with Superior (Wisconsin) of the Northern League in 1935. Donnelly pitched 228 innings for Superior, winning 15 games and losing 15, and leading the league with 184 strikeouts. In the offseason, Duluth, also of the Northern League, traded with Superior for Donnelly. With Duluth he had a record of 11-19 with 232 strikeouts in 214 innings. Donnelly’s durability allowed him to lead the Northern League in losses, wild pitches, walks, and strikeouts. At the end of the season he joined the St. Louis Cardinals organization when Branch Rickey of the Cardinals purchased the Duluth franchise. Springfield (Illinois) of the Class C Western Association was Donnelly’s destination in 1940. Illness hampered him but he pitched a no-hitter against Joplin.9 The Springfield team tried to sell Donnelly to Fort Worth of the Class A Texas League in the spring of 1941. After a brief tryout, Fort Worth decided he was too small to make it as a pitcher10 and returned him to Springfield. Returning to Springfield, Donnelly won 28 games with only 6 losses and set a Western Association record with 304 strikeouts.11 He led the league in innings pitched, complete games, and wins as well as strikeouts. Late in the season Donnelly was sent to Sacramento of the Pacific Coast League, where he pitched in three games. In 1942 he returned to Sacramento and won 21 games pitching for the PCL champions. There Donnelly first played for manager Pepper Martin. In 1943 Martin went to Rochester of the International League as manager, and Donnelly followed him there. On August 17 he threw a no-hitter against the Jersey City Giants, winning 4-0. He ended the year with 17 wins, 8 losses, and an earned-run average of 2.40, putting him in good position for the following year with the Cardinals. A solid spring training in 1945 earned Donnelly the opportunity to be a starting pitcher for the Cardinals. The Sporting News named him to its midseason All-Star team. He completed the season with 8 wins and 10 losses in a career-high 23 starts. This included a one-hitter against the Philadelphia Phillies on June 27. In 1946 Donnelly went to spring training with hopes of being in the starting rotation, but a strong postwar Cardinals pitching staff forced him to the bullpen for the start of the season. A sore arm limited Donnelly’s appearances, and during the All-Star break the Cardinals sold him to the Philadelphia Phillies for the $7,500 waiver price.14 The Giants also put in a waiver claim on Donnelly, but the Phillies claim was accepted due to their worse record.15 After winning one game and losing two for the Cardinals, Donnelly won three games and lost four for the Phillies. 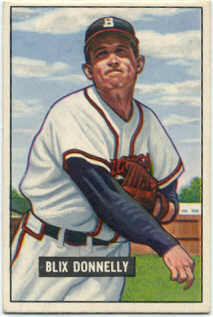 Donnelly began the 1947 season pitching out of the bullpen. Manager Ben Chapman believed that he was not strong enough to go nine innings.16 In late July a rash of injuries to the starting pitchers gave Donnelly an opportunity to start 10 games, and he finished the year winning four games and losing six, with a career-high 38 appearances.17 In 1948, he started 19 games and relieved in seven. In 1949 Donnelly worked mainly out of the bullpen. Injuries limited him to 10 starts and 13 relief appearances. The front office believed he would be an important part of an improving ball club that could compete for the pennant in 1950. Donnelly headed into spring training in 1950 as the Phillies’ top relief pitcher. During the year he was supplanted in this role by Jim Konstanty, who would win the National League Most Valuable Player award. Donnelly’s limited role and minor injuries led to only 14 appearances. The Phillies won the pennant but were swept by the New York Yankees in the World Series. Donnelly did not pitch in any of the World Series games and at 36 was the oldest player on the young team known as the Whiz Kids. In 1951 Donnelly was the odd man out on the Phillies pitching staff at the end of spring training. An accident with a firecracker burned the forefinger of his pitching hand and limited his work during spring training.18 The Phillies sold him to the Boston Braves, led by his old Cardinals manager, Billy Southworth, on April 16 after he refused assignment to Baltimore of the International League.19 After pitching in only six games, he was released by the Braves on May 12. He immediately rejoined the Phillies and was sent to Baltimore. Starting 25 games for the Orioles, he went 7-6. In 1952 he returned to Baltimore as a player-coach. Pitching in relief, he won five games while losing 11. He retired at the end of the season at the age of 38. In 1953 his contract was transferred to Richmond, but he remained retired. Residing in Olivia, Donnelly worked in a number of businesses, including a barbershop, water-conditioner sales, and outboard-motor sales, and he owned a business selling anhydrous ammonia.20 He died in Olivia on June 20, 1976, from cancer at the age of 62. He was survived by his wife, Helen, and son, James. A version of this biography appeared in the book "Minnesotans in Baseball," edited by Stew Thornley (Nodin, 2009). “Blix Donnelly Is Fan Artist With the Cats,” Brownsville (Texas) Herald, February 19, 1941. “Blix Donnelly Makes Good in Major League: Olivia Boy Is Winning Pitcher in Second Game of World Series,” Olivia (Minnesota) Times, October 12, 1944. “Butlers Beat Ganzels, Even School Series,” Minneapolis Morning Journal, September 1, 1934. “Donnelly Got His Start Here,” Minneapolis Star Journal, October 5, 1944. “Donnelly’s Pitching Best Ever: Sports Writers Join in Praise of Local Man With Cardinals,” Olivia Times, October 12, 1944. Dunkley, Charles, “Blix Donnelly Earns Spurs,” Duluth News Tribune, October 6, 1944. Hall, Halsey, “Kels Sweep Along,” Minneapolis Journal, August 29, 1934. “O’Dea to Braves, Donnelly to Phils,” St. Louis Post Dispatch, July 9, 1946. “Olivia Honors Blix Donnelly at Program,” Olivia Times, October 26, 1944. “Olivia Will Fete Ball Hero,” Albert Lea (Minnesota) Evening Tribune, October 17, 1944. Wesloh, Harry, “Eyes of Baseball World on Olivia in Fall of 1944,” Olivia Times, October 3, 1994. Baumgartner, Stan, “Big Role for Little Blix in Drive to Lift Phillies Out of Basement,” The Sporting News, August 20, 1947. Baumgartner, Stan, “Fuming Phillies point for Giants Club – They’d Most Like to Beat,” The Sporting News, March 7, 1951. Baumgartner, Stan, “Little Blix Out of Pigeonhole on Blue Jays: Typed as a Relief Specialist, Donnelly Wins Starting Role for Next Year,” The Sporting News, October 1, 1947. “Daytona Beach’s Hopes Ride on Draws from Rookie Camp,” The Sporting News, March 9, 1939. “Feast in Pheasants and Base-Hits in Dakota Pheastival,” The Sporting News, October 27, 1948. “Injury Jinx Strikes Phillies Early,” The Sporting News, March 7, 1951. Lieb, Frederick G., “Cards Check Stumbles; Deal Off Pair for Checks,” The Sporting News, July 17, 1946. “Major Flashes,” The Sporting News, July 24, 1946. Ruhl, Oscar, “Boiling Anger Steamed Up Blix: ‘Wanted to Show Billy Southworth’: Too Little Tag Always Irked Bird Relief Ace,” The Sporting News, October 12, 1944. Snow, John, “Blix Donnelly’s Whiffing Blitz Tops 17-Year-Old W.A. Mark,” The Sporting News, November 20, 1941. The Sporting News, July 13, 1939. The Sporting News, July 22, 1937. The Sporting News, November 9, 1960. Weber, Al C., “No-Hit Games 80 Percent Luck, Says Donnelly After His Third,” The Sporting News, August 26, 1943. Roberts, Robin, and C. Paul Rogers III, The Whiz Kids and the 1950 Pennant (Philadelphia: Temple University Press, 1996). 1 Charles Dunkely, “Blix Donnelly Earns Spurs,” Duluth News Tribune, October 6, 1944, 13. 2 “Blix Donnelly Makes Good in Major League: Olivia Boy Is Winning Pitcher in Second Game of World Series,” Olivia (Minnesota) Times, October 12, 1944, 1. 3 “Donnelly Got His Start Here,” Minneapolis Star Journal, October 5, 1944, 24. 4 Halsey Hall, “Kels Sweep Along,” Minneapolis Journal, August 29, 1934, 20. 5 The Sporting News, July 22, 1937, 2. 6 “Daytona Beach’s Hopes Ride on Draws From Rookie Camp,” The Sporting News, March 9, 1939, 3. 7 The Sporting News, July 13, 1939, 12. 8 John Snow. “Blix Donnelly’s Whiffing Blitz Tops 17-Year-Old W.A. Mark,” The Sporting News, November 20, 1941, 19. 9 “Blix Donnelly Is Fan Artist With the Cats,” Brownsville (Texas) Herald, February 19, 1941, 26. 10 Oscar Ruhl. “Boiling Anger Steamed Up Blix: ‘Wanted to Show Billy Southworth,’” The Sporting News, October 12, 1944, 9. 11 Snow, “Blix donelly’s Whiffing Blitz.”. 12 Al C. Weber, “No-Hit Games 80 Percent Luck, Says Donnelly After His Third,” The Sporting News, August 26, 1943, 4. 13 "Olivia Honors Blix Donnelly at Program,” Olivia Times, October 26, 1946, 1. 14 “O’Dea to Braves, Donnelly to Phils,” St. Louis Post Dispatch, July 9, 1946, 5B. 15 “Major Flashes,” The Sporting News, July 24, 1946, 27. 16 Stan Baumgartner, “Big Role for Little Blix in Drive to Lift Phillies Out of Basement,” The Sporting News, August 20, 1947, 12. 17 Stan Baumgartner, “Little Blix Out of Pigeonhole on Blue Jays: Typed as a Relief Specialist, Donnelly Wins Starting Role for Next Year,” The Sporting News, October 1, 1947, 22. 19 Stan Baumgartner, “Fuming Phillies Point for Giants – Club They’d Most Like to Beat,” The Sporting News, April 25, 1951, 8. 20 The Sporting News, November 9, 1960, 28; Robin Roberts and C. Paul Rogers III, The Whiz Kids and the 1950 Pennant (Philadelphia: Temple University Press, 1996).